Comment #29 Emily Wells! Congrats Emily ! It's that time again for another Goosey Cookbook Review & Giveaway. This time I had the opportunity to review another cookbook from Gooseberry Patches 101 Photo Cookbook Series. 101 Breakfast & Brunch Recipes. I mentioned in my last cookbook review for Gooseberry Patch 101 Cozy Casseroles, that is was my favorite cookbook in their photo series. Well, I find myself saying it again, so I've settled on loving them all. The newest edition to the 101 cookbook series contains 101 tried and true breakfast & brunch recipes from great home cooks like you and me. This new cookbook has so many awesome recipes that I found it hard to choose as usual. They have quick and easy recipes as well as a few that would be great for overnight guests. I dog eared a bunch of pages to try out over the holiday season when we have family in town. Breakfast seems to be the one meal that I struggle with. We have our favorites, so I usually end up making the same things over and over. There's nothing wrong with that especially if it's a good dish, but it can tend to get a bit boring. I think this breakfast and brunch cookbook arrived at a perfect time for me. Rise and Dine, Leisurely Weekend Mornings, Come to Brunch & Corner Bakery. I couldn't decide which chapter was my favorite, because this cookbook has so many great recipes to choose from. Here is a little sample of some of the recipes. Griddle Cakes, Poor Mans Pancakes, French Toast, Brunch Casseroles, Hot Chocolate Muffins, Egg Dishes, Raised Doughnuts, Coffeecakes and Yummy Drinks. I started off my review with these easy Open House Waffles. This recipe comes from Barbara McCurry in Carpinteria, Ca. Barbara says every Saturday she makes these waffles for her family and they love them. When I make waffles I usually use my favorite homemade waffle recipe. I was excited to give this one a try. This recipe started with a biscuit baking mix, but in the end you couldn't even tell. The waffles baked up nice and fluffy and crispy on the outside just how we like them. I did substitute all purpose flour for millet flour, because I don't use millet. These waffles will defiantly be making another appearance on our breakfast table. Along with the waffles I whipped up a batch of Frosty Orange Juice from Tiffany Classen. I knew these would be great right off the bat. I have a similar recipe and they remind me of the orange Julius I enjoyed as a kid. This recipe only requires 6 ingredients and that's it. It's thick, frosty and taste just like a dreamsicle. My kids ask me to make these quite a bit and I can't blame them. The last recipe that I reviewed was from the Corner Bakery Chapter. Victoria Mitchel from Gettysburg, PA. took her favorite coffeecake recipe and adapted it into a pumpkin version perfect for fall. This was my favorite recipe out of all the ones I reviewed. We love pumpkin so I knew it would be a hit, but I didn't know everyone would love it so well. This coffeecake utilizes a yellow cake mix (you gotta love that). Pumpkin puree, brown sugar, cinnamon and pumpkin pie spice make up the yummy cake. Finally it's topped off with a cinnamon streusel topping. Goodness it was so good. I will be making this again when Thanksgiving rolls around. All I have is nice positive comments about this new cookbook. If you're a lover of all things breakfast and brunch than this is must have cookbook for your collection. 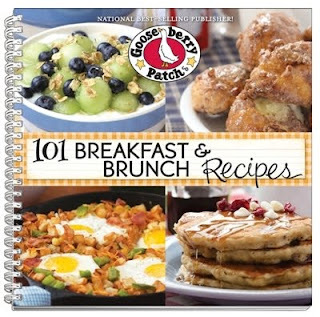 Right now you can purchase Gooseberry Patch 101 Breakfast & Brunch Recipes for $14.95. That's right my friends this yummy cookbook hit the shelves on August 16th, so it's available right now! Hop on over to Gooseberry Patch and order yourself a copy. While your there get one for a friend, because these cookbooks make wonderful gifts. Well my friends it's Giveaway time!!! In usual fashion ♥ Gooseberry Patch ♥ has generously provided me with second copy of 101 Breakfast & Brunch Recipes to giveaway to one of my readers. Leave a comment on this post telling me what you're favorite breakfast dish is? (Mandatory entry) For me it's Grandma Macks Breakfast Casserole & my Sausage Cream Cheese Crescents. You can do any or all of the following for extra entries. Please leave a separate comment for each one. 6. Follow Mommy's Kitchen on Pinterest. I will announce the winner on September 11th 2012. I will pick a random winner using random.org and announce the winner on this blog, face book and twitter. Contest is open to U.S & Canadian Residents only due to shipping charges. If you leave an anonymous comment please include your email address in your comment. That way I can contact you in the event that you're the winner. Winner will have 48 hours to reply or a new winner will be chosen. Good Luck to everyone that enters!!! In a bowl, whisk together baking mix, flour and baking soda. Add remaining ingredients except garnish and mix well. Drop batter by 1/2 cupfuls onto a heated waffle iron; cook according to manufacturer's directions. Top with maple syrup, strawberries and whipped cream. Serves 6-8. In a bowl, combine dry cake mix, pumpkin, eggs, oil, water or buttermilk and pie spice. Pour half the batter into a greased 13×9 baking pan. Set aside remaining batter. Mix together 1/3 cup brown sugar and 3/4 tsp cinnamon and sprinkle over the batter in the pan. Carefully spread remaining batter over the cinnamon mixture. Combine flour with remaining brown sugar, remaining cinnamon and butter and mix well. Spread evenly over the top. Bake at 325º for 30-40 minutes or until a toothpick inserted in the center comes out clean. I follow Gooseberry Patch on Facebook. I'm in the GP circle of friends. I follow Mommy's Kitchen on facebook. My favorite breakfast food is blueberry muffins. My favorite breakfast dish is German Pancakes! I make a spinach leek quiche. I must admit I love but I do not have very often. I also love love cream of Wheat. I receive the Gooseberry circle of friends. My favorite breakfast food is a Breakfast Casserole. I'm in the Gooseberry Patch circle of friends. Follow Mommy's Kitchen on Pinterest. I have mention this giveaway on your face book page. Our fave breakfast dish is your Hawaiian bread French toast! Absolutely spot on! Thanks for sharing! I like French toast (as long as its not too "eggy"! I SHARED THIS GIVAWAY ON MY FACEBOOK PAGE,I AM A FAN OF MOMMY'S KITCHEN ON FACEBOOK. My favorite breakfast is waffles - I can't wait to try the open house recipe! My family enjoy a sausage quiche I make with fresh fruit. I just found your blog and love it! :) I liked your blog on Facebook. I followed GP on Facebook too. I joined GP circle of friends, too! And my favorite my breakfast dish is a bacon, egg, and hashbrown skillet with cheese. Mmm. My favorite breakfast food would be eggs over medium with toast! I am a fan of Gooseberry patch on FB! I "liked" mommy's kitchen on FB! My favorite breakfast would be the one someone else cooks for me :) But when I have to cook I love my biscuits and gravy. I joined circle of friends. My favorite breakfast food is oatmeal. Look forward to seeing what oatmeal recipes are included in this new cookbook. My daily breakfast is fried eggs and grilled toast with honey! Thanks! I love any type of breakfast casserole with fruit. Especial casseroles with eggs and sausage. I love Mommy's Kitchen . Follow on Facebook, follow on Pinterest, member of Circle of Friends , can you tell I'm retired with time on my hands. Just kidding I keep busy and love life and am a cute 65 year old Nana to 3 boys and we live life to the fullest. I love your recipes !!!!!!!!!!! My favorite breakfast is chipbeef and gravy poured over homemade buttermilk biscuits. Read a good coookbook like a novel. Look forward to new emails with great recipes from Mommy's Kitchen. I love to have french toast for breakfast. My favorite breakfast is chocolate gravy on fresh baked biscuits. Sugar coma!! My favorite breakfast is biscuits & sausage gravy. I can't wait to try the waffles they are my second fav. Thanks for the recipe. I am following on facebook, Mommy's Kitchen as well. Shared the give away on face book. Circle of friends joined & pinterest! I love oatmeal with raisins and fresh fruit, peaches or banana slices topped with greek yogurt. I am now following you on Pinterest. Joined GP Circle of Friends. My favorite breakfast food is hash brown casserole and sausage gravy. My favorite breakfast food is Breakfast Casserole. My recipe uses a crescent roll crust with eggs, milk, mozzarella cheese, sausage, bell pepper, Italian seasoning and a little pepper! I am a fan of Mommy's Kitchen on Facebook! My favorite breakfast dish is any kind of breakfast egg casserole, the kind you can put together the night before and bake in the morning! Tina, I love your Overnight French Toast Casserole! It is by far, my family's favorite breakfast and mine, too! Coffee cake of any kind. Hi became a facebook fan. Became a fan of Mommy's Kitchen. I belong to Gooseberry circle of friends. I am torn between biscuits & gravy, or eggs, sunny side up with, bacon and hash browns!!! Baked French Toast is my favorite breakfast! My favorite breakfast food is chocolate chip pancakes! I follow Gooseberry Patch on facebook! Since I am trying to eat a bit more healthy......my favorite food is oatmeal and fruit. I love raisen bread french toast but I'm anxious to try the pumpkin steusal coffee cake. I'm a fan of Gooseberry Patch on FB. I am part of the GBP Circle of Friends group. I am a fan of Mommy's Kitchen on FB. I really love baked oatmeal, but it's not so popular so I would have to say....sausage gravy and biscuits. YUM! I love Grandma Hunter's Egg Brunch and Cheesy Potatoes. Thanks for the chance to enter. I am a facebook fan of Gooseberry Patch. Thanks for the chance to enter. I am Gooseberry Patch Circle of Friends. Thanks for the chance to enter. I am a facebook fan of Mommy's Kitchen. Thanks for the chance to enter. My favorite breakfast is a bacon, egg, hashbrown and cheese breakfast burrito. My favorite breakfast is sausage gravy, biscuits, eggs, and grits! I've been a fan of Mommy's Kitchen on Facebook for a long time! I love pecan waffles, syrup and sausage. I love Pancakes with warm maple syrup and of course some bacon with it. I am a follower of Gooseberry Patch on Facebook. I am now a follower of Mommy's Kitchen on Pinterest. Oh my gosh, you have some great stuff on there. I will be spending alot of time looking at it all. Thanks. My favorites have to be a good hot coffee cake fresh from the oven with butter on it or French toast. My fave breakfast is sausage patty with pepper jack cheese w/ egg and banana peppers sandwich! My favorite breakfast is buckwheat pancakes with fresh strawberries and homemade whipped cream with a chilled mimosa and a good cup of coffee. My favorite breakfast is bacon, eggs, and fried potatoes with biscuits. I have joined the circle of friends and can't wait to start receiving updates. I not only mentioned this contest on my Facebook page, but I gave Mommys Kitchen a shout out for such an awesome blog. my fav. is breakfast is fresh fruit and cottage cheese or cheese chunks. Joined Gooseberry Patch "Circle of Friends"
I joined Gooseberry Circle of friends and received a few free recipes!! Yeah! My favorite breakfast is definitely my father-in-law's scones with a hot cup of coffee! They are heavenly. Love following you and your recipes! My family has a few breakfast favorites. We love Monkey Bread, Fried Cornmeal Mush and Sausage gravy with biscuits!!! Our favorite breakfast is sausage rolls w/ mustard. We also love Creme Brulee French toast casserole. My favorite breakfast would be sweet crepes with different kinds of homemade jellies or maple syrup with homemade whipping cream added to the top. 3 egg omelet with salmon and goat cheese, capers sprinkled on top! I really like the Southern Brunch casserole recipe my mom passed down. It's something you can make the night before and just pop in the oven in the morning....so good! My family's favorite is French toast. I have an egg back that I love to make for breakfast. I love breakfast casseroles, especially those with sausage. My favorite breakfast dish is good ole coffee cake! I'm a fan of Gooseberry Patch on facebook. LOVE them! I would have to say my favorite is Breakfast Casserole and fresh fruit!! my favorite is sausage gravy w/ biscuits and fried apples. i love french toast with bacon. I am in the GP circle of friends. I follow Mommy's Kitchen on Pinterest. I follow GP on FB. My favorite breakfast is homemade cinnamon rolls with cream cheese icing. I love homemade buttermilk biscuits with sausage and my traditional Potato Casserole! I am in the Circle of Friends. My favorite breakfast is blueberry pancakes with bacon, and a cup of coffee.